Christmas Hats! 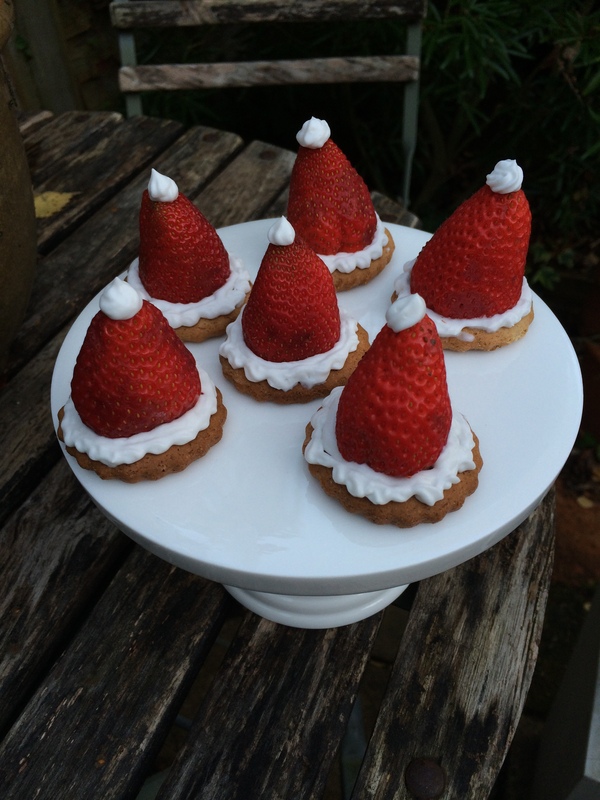 Black Pepper, Coconut Cream and Strawberry Festive Fun! A few hours before you make these (or a day if you can) you need to set the coconut milk. I use this variety. Pop the flour, baking powder, spices and sugar in a food processor and blend briefly. Add the margarine and mix again for a minute or so. While this is mixing break the egg in to a bowl and whisk the maple syrup in to it to form combine. Trickle a little of this mixture in to the processor bowl while it is running slowly. Keep adding until the mixture forms a firm dough (you may not need all of it). Pop the biscuits on to a lined baking sheet and bake in the oven for 12 – 15 minutes or until they start to brown. Remove and allow to cool. Take the solidified coconut cream and using electric or a hand whisk beat until fluffy. If you want a little sweetness add a little unrefined icing sugar in as you whip it. 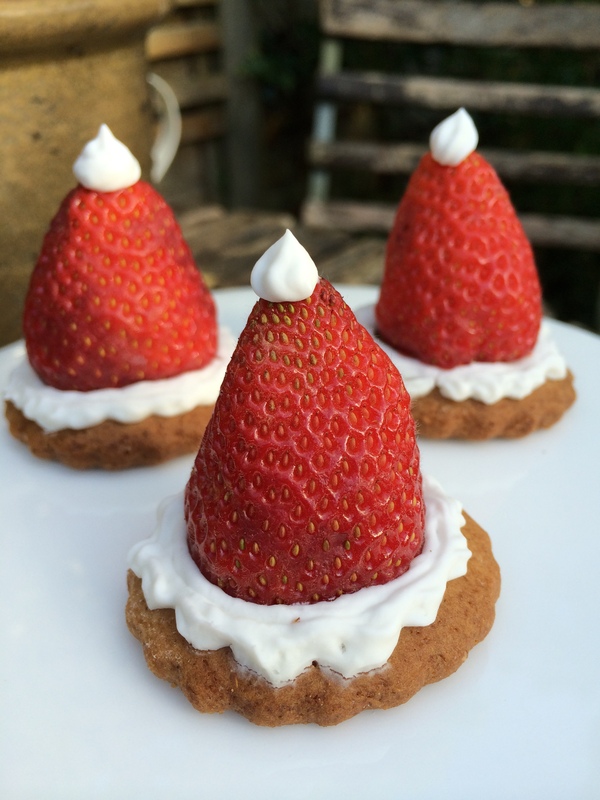 Remove the stem of the strawberries and cut the top off each to give a flat base. Now you can assemble your biccies! Pop the whipped coconut cream in to a piping bag. If you don’t have one (I don’t!) then put it in a plastic ziplock bag and just snip the corner of the bag off to use as a nozzle. Pipe a small amount of cream on to the centre of each biscuit. 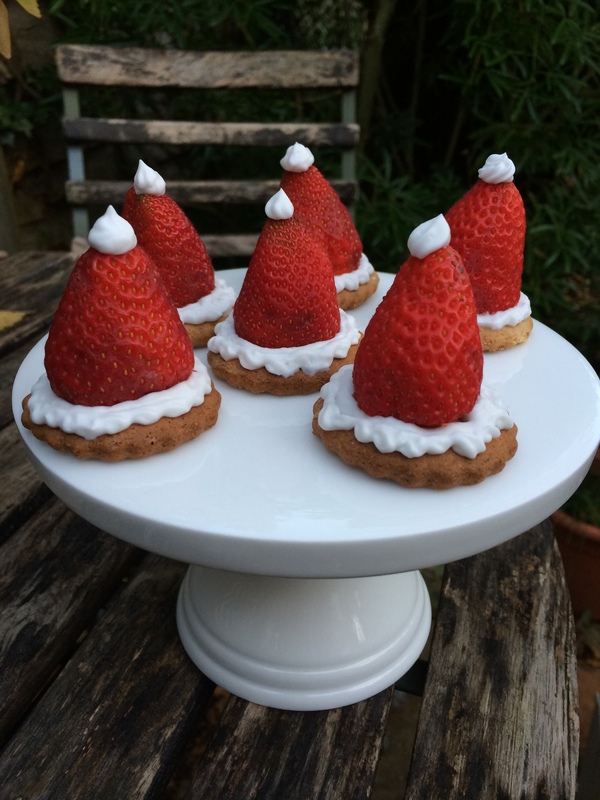 Pop a strawberry on top and then pipe around the base of the strawberry and add a little dot of cream to the top (for the bobble on the hat!). You could dust with a little icing sugar and a grind of black pepper if you wanted to. Serve as soon as possible. They will last overnight but the biscuits will go softer so wait to assemble until as close to serving time as possible. Any extra biscuits can be stored in an airtight container for a few days and they will stay crispy.